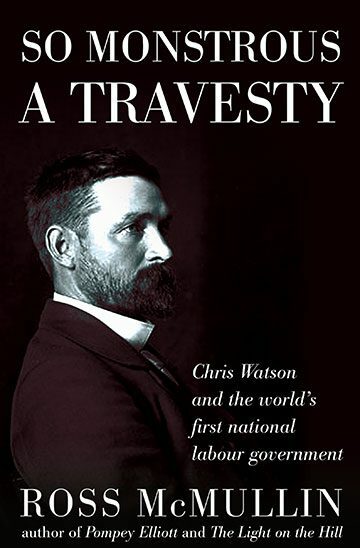 So Monstrous a Travesty: Chris Watson and the World’s First National Labour Government tells the story of Australia’s third prime minister and his pioneering government, the culmination of Australian Labor’s astonishingly rapid rise. Chris Watson’s ministry included two future prime ministers, a practically blind ex-labourer, the only MP to be expelled from Australia’s federal parliament, the only MP to serve in a Labor ministry without being an ALP member, and a hard-drinking ex-premier who feuded with the British commander-in-chief of Australia’s defence forces. This insightful book explains how the government came to office, assesses its record and achievements, and illuminates its place in Australian history. This book tells the story, succinctly and with elegance, of the first national Labour government in the world … With this book, Ross McMullin has reinforced his reputation as the pre-eminent historian of the ALP. The great strength of this book is in the writing … McMullin presents the story of the Chilean-born Australian Prime Minister in page-turning style … He makes the reader feel part of the story and his obvious enthusiasm and sympathy for the subject draws you in … Watson and Labor seized the opportunity to show the Australian people they were fit to govern and to disprove the hysterical views put forward by their political opponents and their supporters in the mainstream press. This argument is presented and sustained convincingly, using McMullin’s considerable narrative skill to sweep the reader along with the tide of events. Ross McMullin has written a short, fascinating history of the Watson government, So Monstrous a Travesty — a title taken from the tirade of press abuse heaped on Australia’s first [national] Labor government. The Watson Labor government rose unexpectedly, survived precariously and fell predictably — all within the space of four months. It left no significant legislative imprint. If this seems a slim basis for a book-length study, Ross McMullin proves otherwise in this absorbing, deftly related account … McMullin’s command of the terrain is enviable. Characteristic of his writing, it features keenly observed sympathetic portraits of the key Labor players, including future prime ministers Andrew Fisher and Billy Hughes, which infuse the narrative with the flavour of collective biography. Stir in the ingredients of scheming Tories and a hostile capitalist press and McMullin produces a recipe irresistible for ‘true believers’. He’s a meticulous researcher. I strongly suspect that McMullin is the first historian to check the response of the Tungamah and Lake Rowan Express to the formation of the Watson government. He also has an eye for the little details that graphically illuminate personality and place. We learn that Senator Gregor McGregor was the only Labor minister who didn’t read the oath of allegiance at the swearing-in ceremony of the new ministry; being almost blind, he had memorised it, and then surprised onlookers by reciting it with perfect accuracy. It’s a simple story, but how easily it could have been missed by an historian less able than McMullin, and how much it says about McGregor’s sense of dignity, which, for this reader, briefly overwhelmed the wonder at a government minister having eyesight so poor that he ‘had to have documents read to him’. This book is beautifully crafted. McMullin does more than simply tell the story of the Watson government, although he does that well. With carefully placed chapters admirable for both their economy and readability, McMullin narrates the emergence of the Labor Party in Australia in the late nineteenth century, and compares it with parties of the left elsewhere in the world. Australian Labor, he reminds us, was on the agenda in contemporary European debates about the future of socialism. It provided an example to be emulated, or shunned, depending on whether you were a revolutionary or a moderate. This is an altogether splendid little book, being as useful and readable in its 175 pages of text as the same author’s vastly longer life of Pompey Elliott (750pp). Dr Johnson would have said that Ross McMullin can not only cut a colossus from a rock but can carve a head on a cherry stone … It is hard today to credit the savagery of the prejudice against the very idea that there could be a Labor government but McMullin amply demonstrates it … The Watson government, which was doing well and which promised better, was turned out of office on a pettifogging technicality and without a general election. This aroused Hughes to his accomplished heights of provocative invective … This engaging book has been well written, well designed, and well printed and bound … I should think eager readers would rush to buy a series of exactly such books, each dealing with a neat and manageable, small slice of Australian history … The trick would be to present them as McMullin has presented Watson. McMullin’s book has a wonderful description by Hughes of Watson’s attire at the first cabinet meeting: ‘a superb morning coat and vest, set off by dark striped trousers, beautifully creased and shyly revealing the kind of socks that young men dream about and shoes to match. He was the perfect picture of a statesman.’ In 1904 it was a radical and, for many people, frightening notion that Labor would actually govern. Such an idea had yet to be tested and Watson delivered the trial run … McMullin is surely correct in seeing Watson’s triumph not in any decision but in proving to the nation that Labor was fit to govern and able to govern properly. This is Watson’s legacy. The great Labor governments of the future walked on his foundations. There are many striking vignettes in this edifying tale. Soon after Watson was sworn in, for example, he had to attend a function in Melbourne’s Exhibition Building. The man on the door would not let him in. In an era before radio and television, he had simply failed to recognise the Prime Minister. Watson meekly produced his entrée card. A highly readable and thorough account … The chapter dealing with the parliamentary machinations surrounding the Watson government’s downfall is particularly good … There is also an interesting chapter dealing with press and other opinions on the advent of the government, one newspaper comment providing the book’s So Monstrous a Travesty title. McMullin also locates his history in the longer-term development of Labor (and labour) in Australia and makes some international comparisons. This is an excellent history, finely honed and thoroughly researched. 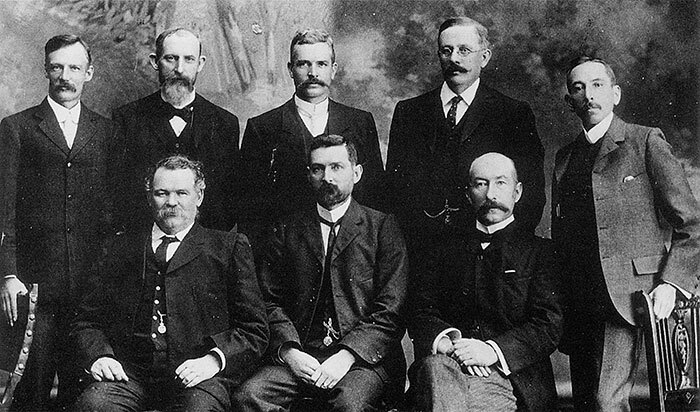 It canvasses not only the achievements and difficulties of Watson’s minority Labor government from April to August 1904, but also the fortunes of the Australian labour movement from the pastoral strikes of the 1890s until World War II. McMullin is well equipped for such a task after having published his magisterial and very readable history of the Labor Party, The Light on the Hill: The Australian Labor Party 1891–1991 (1991). Again, he combines his detailed knowledge of Labor’s history with a deft and often entertaining touch.